Hobbing is a machining process for gear cutting and cutting splines on a hobbing machine, which is a special type of milling machine. The teeth or splines are progressively cut into the workpiece by a series of cuts made by a hob. Helical Gears The angled teeth engage more gradually than spur gear teeth causing them to run more smoothly and quietly. With parallel helical gears, each pair of teeth first make contact at a single point at one side of the gear wheel a moving curve of contact then grows gradually across the tooth face to a maximum then recedes until the teeth break contact at a single point on the opposite side. Spur gears or straight-cut gears are the simplest type of gear. They consist of a cylinder or disk with the teeth projecting radially, and although they are never straight-sided in form, the edge of each tooth is straight and aligned parallel to the axis of rotation. 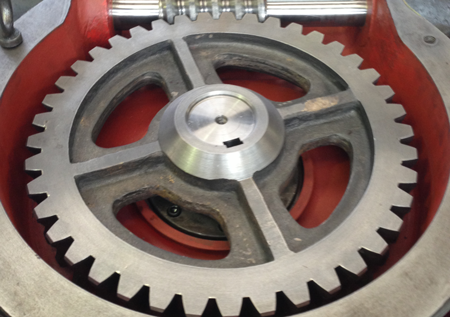 These gears can be meshed together correctly only if they are fitted to parallel shafts. 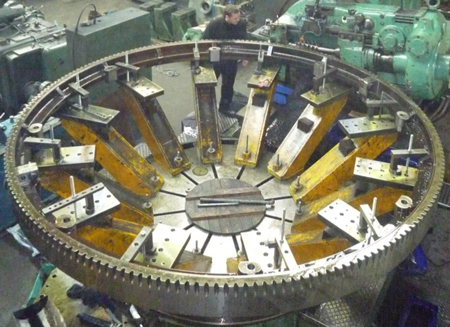 SBT Gears have a wide variety of hobbing machines that allow us to generate gears ranging in size from as little as 50 mm up 4250 mm in diameter, our machines are capable of various types of Hobbing from single indexing, Crowning and internal cutting our capacity can be found here. For a full list of our services you can click here. 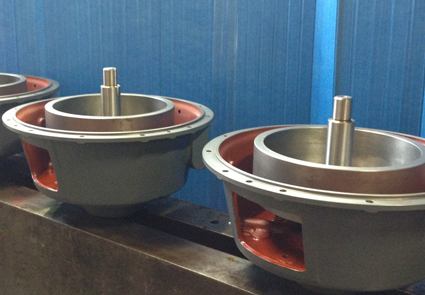 Should you require Gear Hobbing services, we can help.